ST. GEORGE – The Washington County Republican Party will determine the county’s next sheriff as they nominate one of two who filed for candidacy, both Republicans, at the party’s county convention Saturday. The nominee will run unopposed on the November ballot. Incumbent Sheriff Cory Pulsipher is completing his first four-year term as sheriff this year and seeks re-election. Sheriff’s Deputy Hank Kodele is currently serving as a part-time bailiff in the county’s court. Both candidates have extensive law enforcement backgrounds, from entry level to leadership. St. George News spoke with both on some of the concerns of the office. 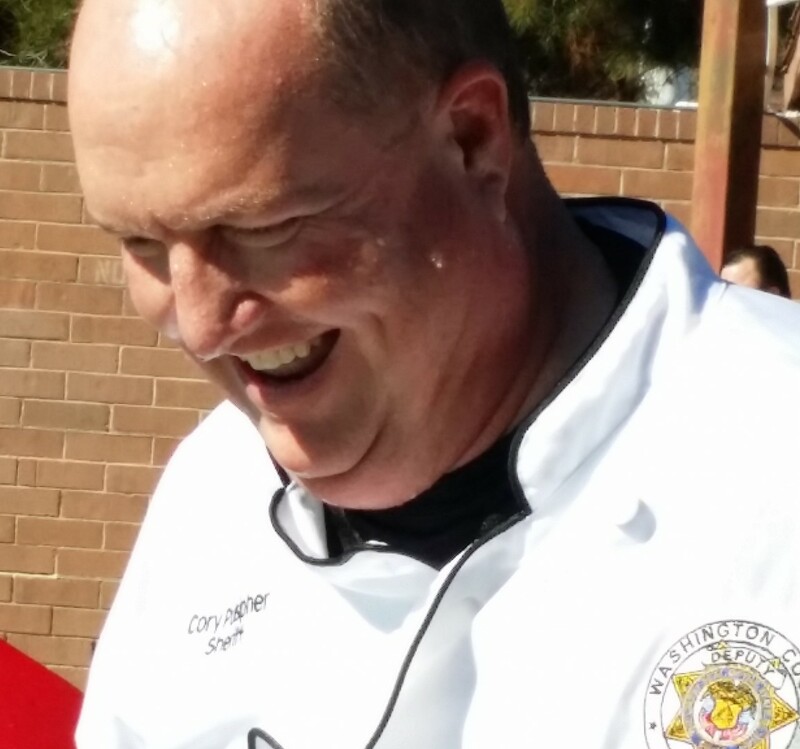 Community – Pulsipher prioritizes community involvement for himself and his staff. He shows up flipping pancakes for kids before they shop with a cop at Christmastime, and he takes the polar plunge for special Olympics, to name only two of many ways he is visibly involved. Washington County Sheriff’s Chief Deputy, Jake Shultz, who oversees the corrections division at the Purgatory Correctional Facility, said Pulsipher is doing a great job, has lived up to and focused on the things he said he’d do during the campaign for his first election, one of which in particular is the Sheriff’s community orientation. Schultz said that Pulsipher does a good job of including people with specialized knowledge, experts, the right people in making decisions. Fiscal responsibility – The largest element of the Sheriff’s fiscal responsibility involves staff wages and benefits, discussed below, looking forward. One of the more unpopular moves Pulsipher made early on when he took office was to restrict county vehicle use assigned to the Sheriff’s Office from personal use. Before he took office, Pulsipher said personnel were allowed – early on even asked ­ – to use county vehicles for personal use without restriction within the county’s jurisdiction. Historically, the policy derived from deputies being few in number and the desire to have them available to respond, under color of authority, to needs that might arise. As the need for off-duty response to incidents declined as staffing increased, no modification was made to restrict personal use of the vehicles. By April 2011, Pulsipher had implemented a policy restricting the use of vehicles to work-related use. It was not a popular policy, he said. Some had become so reliant upon their county vehicle that they didn’t own their own car. Still, Pulsipher said, he saw 4,770 gallons of fuel saved in 2011, 6,153 gallons of fuel saved in 2013, and 6,575 saved in 2013, translating to a total fuel cost savings of $58,618.40. Deriving total mileage from that savings and applying standard reimbursement cost for maintenance, wear and tear, an additional $73, 491.60 was saved. While removing a perceived benefit those employees had enjoyed created morale issues, it was still the right thing to do, Pulsipher said, it is his job to manage tax dollars efficiently to meet the objectives of the office. Pulsipher also eliminated the position of personal assistant to the sheriff when he took office, managing those kinds of duties himself. The Sheriff used inmate labor, at 80 cents per hour, to perform other cost-saving services and maximizing assets. Instead of taking vehicles to auction, for example, he said: “We strip them, refurbish them,” he said, and then sell them at a price of about $12,500 rather than the $7,000-$8,000 they previously received for a vehicle at auction. Immigration – In 2010, Pulsipher ran on a promise to expand the office’s enforcement of immigration laws. Authority to do so came in connection with the 287(g) program by which the U.S. Immigration and Enforcements Division partners with local law enforcement. As the federal government moves toward amnesty programs, Pulsipher said he has directed his efforts under the Fraudulent Identity Security Threats, or FIST program, whereby his office investigates referrals and calls from citizens pertaining to identity theft. State law also directs him to determine the citizenship status of a person charged with either a felony or driving under the influence. Volunteerism – Pulsipher said that his volunteers, for example the Search and Rescue team, save the county time, money, resources and exemplify dedication. To read more about the Washington County Sheriff’s Search and Rescue team, who they are and who pays, click here. County animal shelter – Both candidates envision a county animal shelter established on land by the county’s Purgatory Correctional Facility that would be run by the Sheriff’s Office with some form of cooperative participation from municipalities, volunteers and the use of inmate labor in various capacities – Pulsipher envisions the use of inmate labor to actually build the facility; both Pulsipher and Kodele envision training inmates to tend to the animals; and Pulsipher envisions training them to train some of the animals to be service animals that can be donated back into the community. Kodele’s idea is to get each of the government entities in the county to agree to a central form of shelter, have the entities contribute manpower and equipment, with supervision coming from the Sheriff’s Office and establishing satellite holding areas, perhaps three he said, in areas like Hildale and New Harmony. The benefit would be to animals, citizens and inmates, Pulsipher said, it would teach inmates the skills of taking care of family, of taking care of something more important than themselves. The benefits Kodele sees are similar. It’s an idea he’s been working on for three years, Pulsipher said, though acknowledged the County Commission is not yet fully on board. Staffing – In 2009, the Sheriff’s Office had 165 employees, Pulsipher said. The largest expenditure of the Sheriff’s budget goes to wages and benefits, and as county revenue ebbs and flows with the economy, the commissioners directed an across the board 5 percent cut in every budgetary division of the county. Now, at the beginning of 2014, Pulsipher said his office is back up to 154 with hiring of three more currently approved for a total of 157, right where he needs to be. That combined with three positions vacated for one reason or another places him in a position to advance existing personnel as well as make new hires. Among Kodele’s concerns is a problem he sees with the promotion process. Kodele would hire three additional people, as well, he said. In that he sees a need for increased patrol presence he would hire three additional deputies for the road, he said. Interagency cooperation – Washington County, before Pulsipher took office, had already set the standard of how agencies can actually work together and get along, he said. He has had the ability to influence that and make it tighter, he said, because of the relationship he has with the chiefs more than anything else. Among those efforts Pulsipher listed in which he has either implemented or furthered cooperation and coordination of resources among various agencies to the advantage of the community are: a countywide drug task force, the FIST unit, a member of the Sheriff’s Office assigned to the DEA focusing on local issues within Washington County, working with the county attorney’s office forming a team of investigators that deal with officer involved shootings and other major crimes, and a Metro SWAT team (involving the county’s unincorporated areas and municipalities except for St. George, which has its own SWAT) so that rather than each municipality having its own, personnel are shared resulting in huge savings to each agency. Kodele related an experience when he was with the Utah Highway Patrol assigned to Weber and Davis counties. He said it wasn’t uncommon for the administrations in the two counties to absolutely hate each other, but the guys on the road got along famously because the guys on the road may need help from each other and have to get along. He also said he’d sponsor luncheons and bring all the hiefs and marshals together to identify and resolve problems. Militarization of law enforcement – Both candidates recognize a trend in law enforcement broadly towards what has been coined as militarization of forces, overuse of SWAT teams and that kind of resource. Pulsipher said he has a criteria that must be met in which a warrant or action must meet certain levels of risk or his SWAT team does not go out. Kodele said militarization here hasn’t happened yet and he doesn’t want to see it. It hasn’t come here, he said, and won’t happen on his watch. He also noted outside resources are available at both state and federal levels that can be drawn upon if needed. In short, Pulsipher has been with the Washington County Sheriff’s Office since 1987 and has worked his way up to his current elected position as Sheriff which began in 2011. “I inherited a great organization, I am proud to work here, it was my goal to improve it, to make changes to make it better,” Pulsipher said. Kodele has been a Utah resident for 53 years, a Washington County resident for 16 years, served on the Clearfield Police force beginning in1965, later as chief of Clinton Police Department, spent 14 years with the Utah Highway Patrol and did a tour of duty with the National Park Service at both Mesa Verde and Death Valley national parks. He is certified as a training instructor on several levels, federal and state, and currently works part time for the Washington County Sheriff’s Office as a bailiff. “I’m going to bring experience, education, honor, integrity,” Kodele said. Both candidates favor open door policies, availability to staff and community alike.